Last weekend Annelise had big plans to spend a night out in the country (Waller) with her Aunt Karen and Uncle Bill. We arranged to meet Scott's brother Ron near downtown Houston, which was roughly halfway, chatted for a bit and then they went on their merry way West through obnoxious Houston traffic. 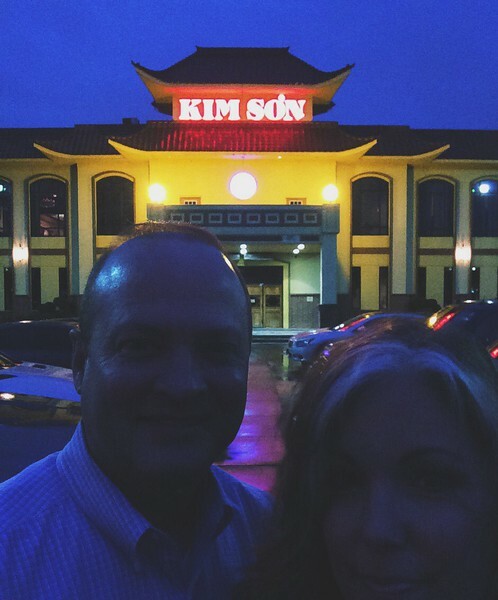 Scott and I went on our merry way to dinner at Kim Son (which was convenient since we met Ron in their parking lot). We shared appetizers, each got hot and sour soup and then shared an entree with chicken, beef, shrimp and scallops. It was all quite tasty but could have been a tad spicier (we've gotten used to Thai food where you have to sip water in between bites). On the way home we stopped by Cheesecake Factory for dessert to go, as you do. Kahlua Coffee cheesecake for me and Banana Cream Pie cheesecake for him. In retrospect, he decided while his choice was good it was too banana pudding-esque. Kahlua Coffee cheesecake is always a good choice. Soon we were nestled in to our respective comfy places, cheesecake in hand (fork?) watching The Million Dollar Arm (that Jon Hamm sports agent recruiting Indian cricket/baseball players movie) on the DVR. It was surprisingly cute. Saturday dawned early with a T-25 workout for me (still not quite finding my exercise groove, but I'm trying, at least a few times a week) followed by Mugs & Muffins at church. The devotional talk this month was won.der.ful. It was all about our perspective during trials and turning negative situations into positive opportunities to show Jesus. It was great! That afternoon Scott and I went to see McFarland USA, which was really good. Not only was it clean, it was funny and inspiring, so we gave it four thumbs up. Is it just me or had Kevin Costner been in a gajillion movies these last few years? We met Ron and Annelise later that afternoon across town at a Red Robin which happened to be in what was possibly the busiest entertainment complex in Houston. #parkingnightmare After burgers and chit chat we headed home with one worn out, but happy, eleven year old. In other news, Annelise passed her second test for Force 410 Sunday afternoon, which was quite the accomplishment. You not only have to know the answers to the questions, you also have to list the scripture references. Whew! 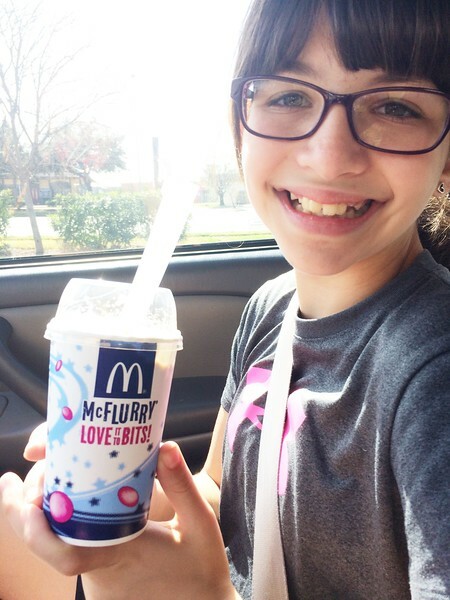 We celebrated with a McFlurry. As one does in these situations. Ice cream and M&Ms are where it's AT, man.